Here is a list of ten must-see documentaries that help expose some of the critical issues facing water in the 21st century. FLOW is an award-winning documentary investigation by Irena Salina into the growing privatization of the world’s dwindling fresh water supply. Salina focuses on politics, pollution, human rights, and the emergence of a domineering world water cartel. She uses interviews with scientists and activists to reveal the rapidly building water crisis at both the global and human scale. Rather than just focusing on the problem, FLOW also provides examples of people and institutions that are working toward practical solutions to the water crisis. 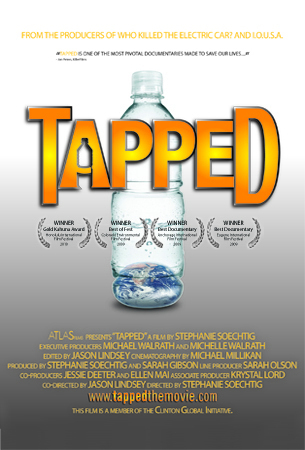 Tapped is a film that examines the role of the bottled water industry and its effects on our health, climate change, pollution, and our reliance on oil. Directed by Stephanie Soechtig and produced by Atlas Films, the film exposes the bottled water industry as an ecological and consumer nightmare where corporations like Coca-Cola, Pepsi and Nestle mine public water sources and sell it back to the public at criminal markup. The film’s website provides lots of resources and ways for you to become involved in the fight against bottled water. Is the next war going to be about WATER? 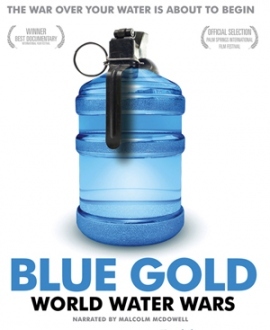 Blue Gold: World Water Wars is an award-winning documentary from director Sam Bozzo that posits we’re moving closer to a world in which water could actually incite war. As water becomes an increasingly precious commodity, corrupt governments, corporations and even private investors are scrambling to control it which leaves everyday citizens fighting for a substance they need to survive. Narrated by Malcolm McDowell, the film takes viewers through the causes of the water crisis — mining, pollution, wetland destruction — and blocks out the potential effects of a water shortage. 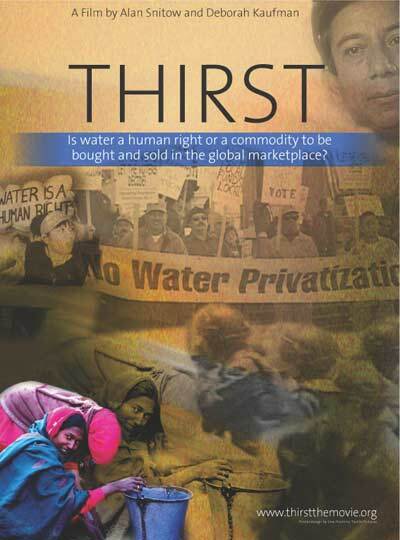 It follows numerous worldwide examples of people fighting for their basic right to water, from court cases to violent revolutions to U.N. conventions to revised constitutions to local protests at grade schools. Photographer Peter McBride traveled along the Colorado River from its source high in the Rocky Mountains to its historic mouth at the Sea of Cortez. In this Yale Environment 360 video, he follows the natural course of the Colorado by raft, on foot, and overhead in a small plane, telling the story of a river whose water is siphoned off at every turn, leaving it high and dry 80 miles from the sea. McBride, a Colorado native, documents how increasing water demands have transformed the river that is the lifeblood for an arid Southwest. 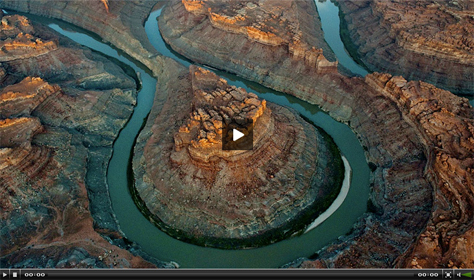 McBride also documents the journey with his photography in the book, The Colorado River: Flowing Through Conflict. This film does a brilliant job of revealing the overuse of one of America’s most iconic rivers. The world is poised on the brink of epochal changes in how water is stored, used, and valued. Is water part of a shared “commons,” a human right for all people? Or is it a commodity to be bought, sold, and traded in a global marketplace? Thirst investigates the privatization of water and tells the stories of communities in Bolivia, India, and the United States that are asking these fundamental questions. Should water be declared a human right? Water On The Table is a character-driven, social-issue documentary that explores Canada’s relationship to its freshwater, arguably its most precious natural resource. The film asks the question: is water a commercial good like running shoes or Coca-Cola? Or, is water a human right like air? 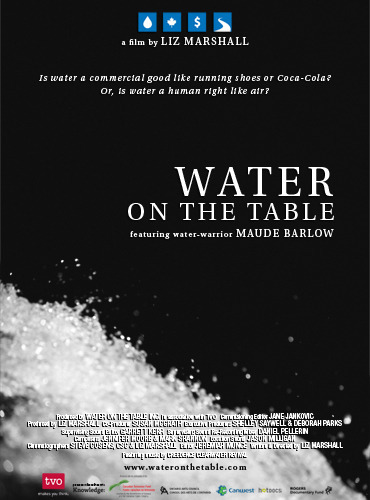 Water On The Table features Maude Barlow, who is considered an “international water-warrior” for her crusade to have water declared a human right. Water must be declared a public trust and a human right that belongs to the people, the ecosystem and the future, and preserved for all time and practice in law. Clean water must be delivered as a public service, not a profitable commodity. The Water Front is the story of an American city in crisis but it is not just about water. The story touches on the very essence of our democratic system and is an unnerving indication of what is in store for residents around the world facing their own water struggles. Residents of Highland Park, Michigan, known as the birthplace of the auto-industry, have received water bills as high as $10,000; they have had their water turned off, their homes foreclosed, and are struggling to keep water, a basic human right, from becoming privatized. The show takes you to the American West where seven states compete for the same water from the Colorado River Basin. In Alaska and Wisconsin, there is an abundance of water. How can they capitalize on their excess supply? The show travels to the south of Chile where water rights are bought and sold and asks if Chile has the answer to the public vs. private water debate. Water is our most precious natural resource. With only 3 percent of the world’s water existing as fresh water, nearly every continent is feeling the affects of the global water crisis. For some, it’s the lack of clean drinking water. For farmers, it’s the inability to feed the thirst of valuable crops. Just as “easy oil” has dried up, fresh water has become more difficult to access and transport. This is truly a water documentary classic! This four-part television documentary was based on the 1986 book, Cadillac Desert, by Marc Reisner. The book is about land development and water policy in the western United States. It gives the history of the Bureau of Reclamation and U.S. Army Corps of Engineers, and their struggle to remake the American West. The book’s main conclusion is that development-driven policies, formed when settling the West was the country’s main concern, are having serious long-term negative effects on the environment and water quantity. The documentary was produced by PBS affiliate, KTEH-TV, in 1996. The parts are entitled Mulholland’s Dream, An American Nile, The Mercy of Nature, and The Last Oasis. The Story of Bottled Water comes from the people behind the Story of Stuff Project. The film employs the Story of Stuff style to tell the story of manufactured demand — how you get Americans to buy more than half a billion bottles of water every week when it already flows from the tap. It explores the bottled water industry’s attacks on tap water and its use of seductive, environmental – themed advertising to cover up the mountains of plastic waste it produces. The film concludes with a call to ‘take back the tap,’ not only by making a personal commitment to avoid bottled water, but by supporting investments in clean, available tap water for all. Inspiration for this post comes from Inspired Water and Treehugger. I hope you have enjoyed the list, but I know you have some other must-see water documentaries that I missed in this post. Please let me know by commenting below. If water is the next oil, then you had better stay informed. My blog posts will do just that. Civil engineer and urban planner focused on creating impacting and sustainable projects by identifying all of the hidden water conservation opportunities available. Particularly interested in working within the realms of sustainable site planning, conservation subdivision design, integrated water management and planning, and low impact development practices. This is the blog for Innovative Water Solutions. We are a company that is passionate about water conservation and providing solutions for our clients that save them water. Got a quick question or want to drop us an awesome comment, go ahead and we will get right back to you. I consent to The Water Nexus Blog collecting my details through this form.